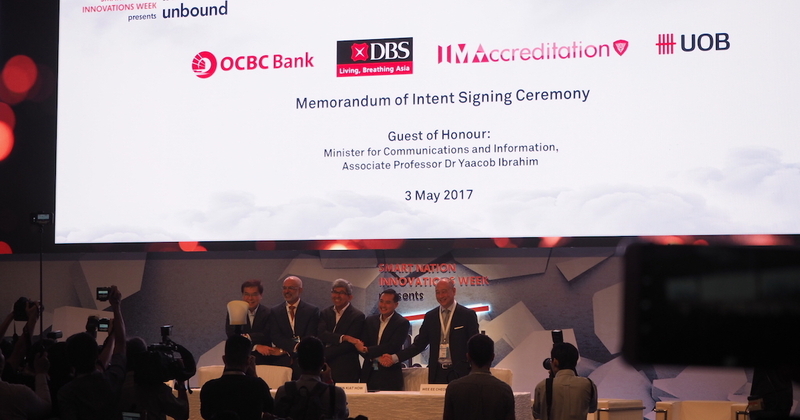 Earlier today (April 28) at innovfest unbound 2017, Accreditation@IMDA (A@IMDA) signed an individual partnership with DBS, OCBC and UOB. Accredited companies would be empowered with access to innovative projects so that they can build their track record in the banking sector. In addition, companies can tap onto the banks’ global footprint to expand internationally, upon successful deployment of their products locally. A@IMDA will collaborate with the banks to feature the companies’ innovative technology solutions to the relevant user departments in the banks, thus supporting their international delivery of innovative, customer-centric banking solutions. 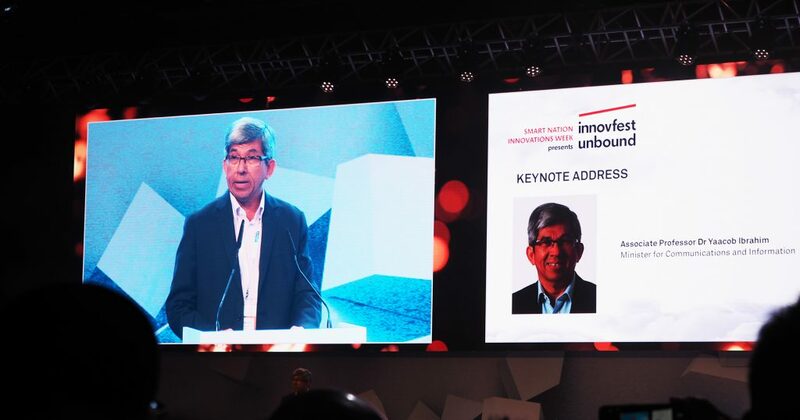 Guest speaker Dr Yaacob Ibrahim, Minister for Communications and Information, praised the 3 banks for their active contribution in creating and supporting innovative FinTech solutions through their individual accelerator programmes. Besides their contributions, the banks have also been test-bedding and deploying innovative FinTech solutions through their organisation. This partnership enables the local banks with access to innovative high-growth ICM companies specialising in Internet of Technology (IoT), analytics and artificial intelligence, and cybersecurity. Through its FinTech foundry programme, DBS will share its problem statements with relevant IMDA-accredited companies. Shortlisted companies will be invited to participate in Proof-of-Concepts to develop suitable solutions for DBS, as well as earn opportunities to pitch and showcase their products to various DBS user groups for potential partnerships. DBS will conduct procurement clinics intended to share general procurement best practices with IMDA-accredited companies. These include proper processes to respond to DBS’ Request-For-Proposal and Request-For-Information, which enables companies to better manage their procurement engagement cycles. “With our roots as the Development Bank of Singapore, support for initiatives that nurture and grow Singapore companies is part of our DNA. In line with this, we warmly welcome the opportunity to participate in the Accreditation@IMDA programme to help promising companies innovate, scale up and expand overseas, as well as further Singapore’s Smart Nation agenda,” said Piyush Gupta, CEO of DBS Bank. The collaboration with OCBC and A@IMDA will provide IMDA-accredited companies the opportunities to participate in OCBC Bank’s projects for disruptive FinTech solutions to meet the bank’s problem statements. A@IMDA will complement OCBC’s mentoring efforts to FinTech companies participating in The Open Vault at OCBC FinTech Accelerator Programme to provide assistance in technical testing and financial advisory. The partnership with A@IMDA supports UOB’s efforts to develop FinTech startups through The FinLab, and provide opportunities for accredited companies to access funding through UOB’s affiliates and partners including OurCrowd and InnoVen Capital. In addition, startups at The FinLab can benefit from A@IMDA’s technical expertise when testing and modelling their solutions. As part of this collaboration, relevant IMDA-accredited companies will be invited to participate in Proof-of-Concepts to develop relevant FinTech solutions for UOB. “The partnership with Accreditation@IMDA will complement and strengthen our ecosystem and provide a new avenue for young, enterprising companies to take their ideas from the drawing board to the global marketplace,” said Wee Ee Cheong, Deputy Chairman and CEO of UOB. Since its launch three years ago, A@IMDA has been a key contributor to Singapore’s digital economy strategy, and plays a vital role in developing a strong Infocomm Media (ICM) ecosystem through nurturing young and promising local ICM companies to scale. It collaborates with SG Innovate and industry accelerators to provide customised assistance to high-growth startups and SMEs to accelerate their growth, and to internationalise through IE Singapore and enterprise partners. To date, A@IMDA has accredited 17 companies and this number is set to grow, helping promising enterprises grow and compete in the global market, said Dr Yaacob.